1. What is a “green roof”? What: At its most essential level, a green roof is a roof surface which is designed to accommodate vegetation and/or accommodate human use (ie. specialty gardens, patios, play areas, ponds, driveways, etc.). Not only is utility of the roof space created but numerous ecological and economic advantages exist. These advantages include: extended roof life expectancy, sound insulation, thermal insulation, additional usable space, natural habitat for flora and fauna, high water retention, climate moderation, pollution reduction, let alone the visual enhancement of the city landscape. Where: Generally, modern green roofs started over 40 years ago in Germany and are rapidly becoming a popular building addition in countries around the world. 2. Why have a green roof? Extensive green roof: A roof which is covered in low growing vegetation and is usually installed to create advantages from the additional surface protection and maximize ecological benefits. 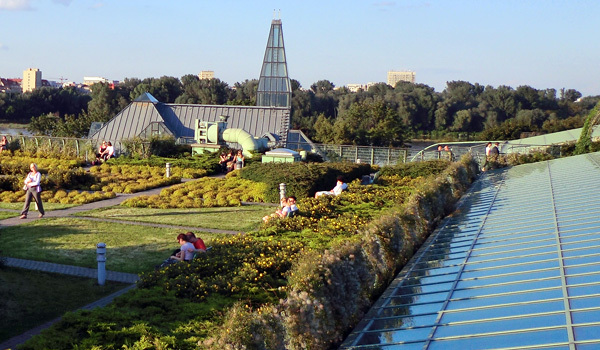 Intensive green roof: A roof which can be covered with large plants, shrubs and trees as well as structures for human activity (walkways, benches, fountains, parking, and so on). They are usually intended to take the form of well-kept gardens. Anything on the ground is possible on the roof given that an adequate load bearing capacity of the building is present. These definitions are based on the FLL (Forschungsgesellschaft Landschaftsentwicklung Landschaftsbau e.V.) 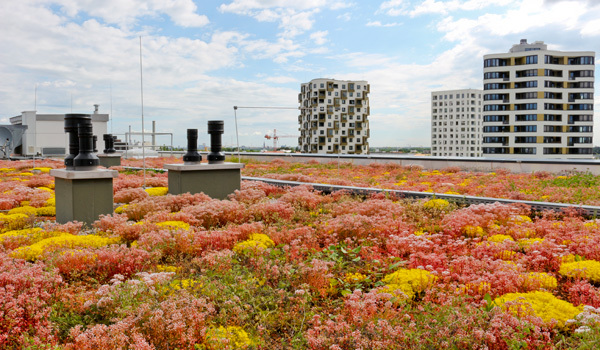 Guideline for the Planning, Execution and Upkeep of Green Roof Sites, release 2002. 4. What is the weight of a green roof? Green roof weights vary depending on the thickness of the build-up. A thin layered extensive green roof, when saturated with water, will weigh around 95 kg/m². Light-weight solutions are available starting from ca. 60 kg/m². An intensive green roof requires a higher load bearing capacity. Depending on the build-up height and the vegetation, the weight of simple intensive green roofs starts with ca. 195 kg/m². More luxurious green roofs such as our “Roof Garden” type imply more weight, starting from ca. 340 kg/m². On roofs with less load bearing capacity, intensive green roofs are still possible with ZinCo's ingenious new system build-up “Roof Garden with Aquatec®”, whose weight starts with ca. 180 kg/m². Calculations: When calculating the load bearing capacity, building architects and civil engineers are able to provide the necessary information. Often, roofers and carpenters are also able to help with these calculations. 5. Will the waterproofing be damaged by the plant roots over time? No, not if appropriate measures are taken. There has been a long standing bias against green roofs due to belief that plant roots will grow into the roof and damage the construction. If designing a new building, a root resistant waterproofing should be specified. It is recommended to use a waterproofing with a certificate of “root proofness” in accordance with German FLL regulations. The investigation of root protection was established by the FLL as early as 1984 and today the certification is widely accepted by specialists as an authority. If designing a green roof on an existing roof construction, you must find out whether the waterproofing is root resistant (according to the FLL). If you are not sure about this, contact the manufacturer of your waterproofing material and get them to advise whether it is root resistant and if so, according to which norms and criteria. If your existing waterproofing is not root resistant, there will be need for an additional protection layer. Special root barriers have been designed to prevent damage to the waterproofing and the roof construction. The rootproof layer is integrated into the green roof build-up over the top of the waterproofing. 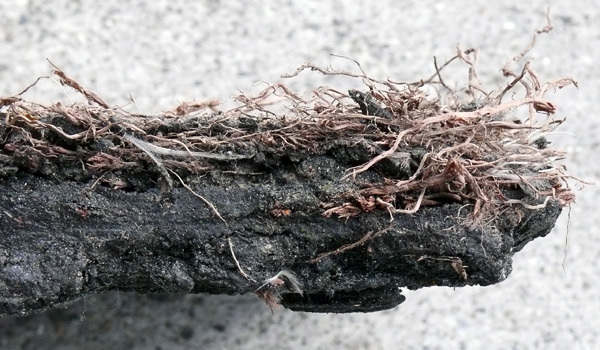 The quality of the root protection layer is extremely important since any leaks or roof damage caused by roots will result in costly repair of the damages. Reliable root barriers will also have a certificate of “root proofness” in accordance with German FLL regulations. 6. Which one has a higher life expectancy – a green roof or a gravel roof? How: A gravel covering provides limited protection from extreme environmental conditions which can impact the roof membrane and age it rapidly; whereas, the substrate and vegetation layers of a green roof provide protection for the waterproofing. 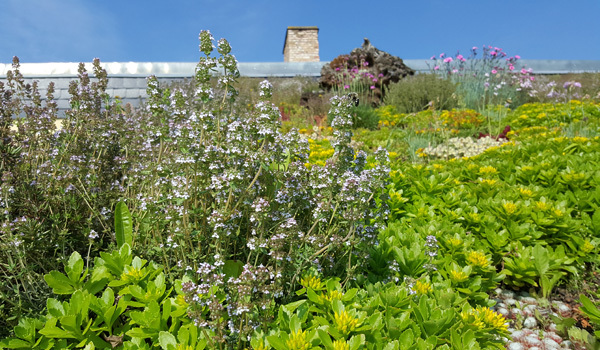 The additional layers of a green roof help to mediate extreme temperature differences; annual fluctuations are reduced from 100 °C to only 35 °C and daily fluctuations are reduced from 60 °C to only 15 °C. The build-up also provides protection from UV radiation, ozone, and mechanical damages, for example, hail, wind, maintenance works, etc. As a result the life of a roof is easily doubled. * The ”Fraunhofer Institute” was established as a research organization in 1949 and was named after the successful researcher, inventor and entrepreneur Joseph von Fraunhofer (1787–1826). Today the institute is the largest organization for applied research in Europe. 7. Whom shall I contact for the installation of a green roof – a roofer or a landscaper? Green roofs are often installed with roofing and landscaping companies working cooperatively. Roofers specialize more in load bearing capacity, waterproofing, and thermal insulation aspects; whereas, landscapers specialize more in vegetation, substrate and plants. Before hiring a professional it is always advisable to know the work he has done. 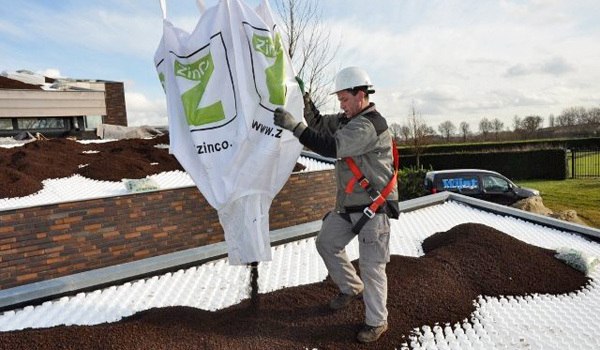 In addition, ZinCo UK will be able to recommend reliable companies experienced in the installation of green roofs. 8. Is it possible to use regular topsoil on green roofs? Regular topsoil is not recommended for use on either extensive or intensive green roofs. The most important characteristics of a green roof substrate are good water permeability and high maximum water capacity. Both of which are often low in topsoil. Some topsoil may have better water permeability and retention capacities than others; however, the variability in quality is high and relying on topsoil is risky. Other problem for vegetation when using topsoil is dryness; topsoil gets especially hard when dry and can damage plant roots. The issues mentioned above can be amended by adding organic content however, this could compromise the fire resistance of the substrate. In comparison to the mineral substrates which are normally used for extensive green roofs, topsoil has low water permeability, low water retention, much higher weight and less suitable chemical and physical properties. In addition, the contamination from weeds and pests creates competition for drought resistant plant communities which are used on extensive green roofs. 9. What can I use instead of topsoil? 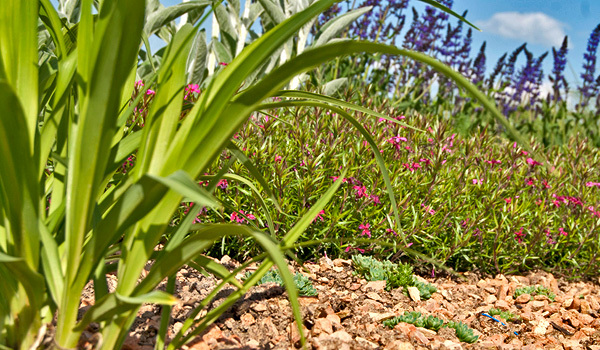 An alternative to using topsoil are the substrates which are specially engineered to complement green roof vegetation. The engineered substrates are designed for the extreme conditions of the roof (increased wind, frost-and-thaw-cycles, full sun exposure ...) as well as accommodate for the lost natural characteristics that a soil would provide at ground level. The substrates are tested to ensure that they meet FLL guidelines; this means that they ensure a long life for the green roof. 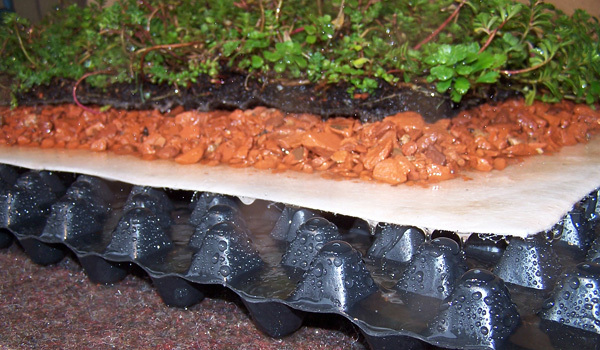 The substrates have been used for many years and for millions of m² of green roof build-ups. They can also be adapted to compliment particular local climate conditions. 10. 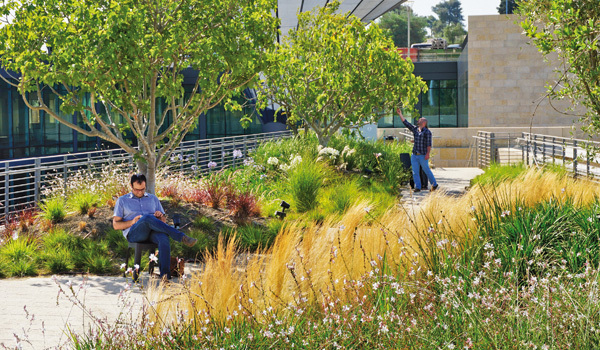 Is it possible to combine rainwater use with green roofs? Most definitely, and it is a great way to save on additional costs. With up to 50–90 % of precipitation being retained by the green roof build-up any excess water can be collected and stored in a modern rain management system or cistern. Another benefit is the vegetation and substrate layer acting as a water filter; these layers hold back particles, dust, solute pollutants, and even heavy metals. The excess rainwater can then be used to irrigate the roof, used as toilet water, or any other available purposes. Water coming from the roof can have a light brown tint as a result of the humic particles in the substrate layer; therefore, it is not suitable to be used as wash water. If run-off water is used for toilets it is best to have a sign indicating “natural cloudiness” in order to avoid confusion. Calculating storage capacity: It should be noted that during the summer months most rainwater is used by the green roof itself and this should be incorporated into the calculation for the cistern. 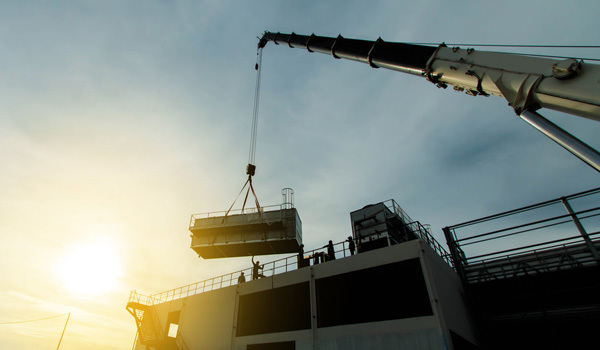 To make the final determination for the necessary storage capacity a professional for modern rainwater management systems (or similar professional) can be consulted. With global warming, increasing sealed surfaces and radiation from buildings, industry, and traffic, the temperatures within cities are constantly rising. In the summer temperature differences can almost reach > 7 °C between the more heated city center and the cooler adjoining suburbs; thus, an island effect of temperature is created. Natural “air conditioners” such as green areas and parks provide soil humidity and the vegetation absorbs up to 80 % of the received energy. In densely populated districts green space is especially rare. The missing cooling effect during the night in cities drastically reduces the quality of life and impairs the health of the inhabitants. In regards to this issue, among many others, green roofs can offer a solution. Green roofs can decrease the “urban heat island effect” by helping to reduce temperatures and humidify the air. A more comfortable environment is then created for inhabitants, adjacent offices, and apartments alike. 12. How does a green roof help in terms of energy efficiency and insulation? Temperatures on the roof surface have an effect on the indoor building temperature; in turn, this contributes to the amount of energy required to heat or cool the building. The additional vegetation layer over the roof acts as a buffer between indoor and outdoor temperatures. As well, during summer months plants will transform heat and soil moisture into humidity which in turn cools the surrounding environment, including the building. During cooler months, the buffering capacity of the green roof provides insulation against heat loss through the building roof. Accredited thermally insulating drainage layers add to the insulating capacity of the green roof and therefore, help maximize insulation benefits. 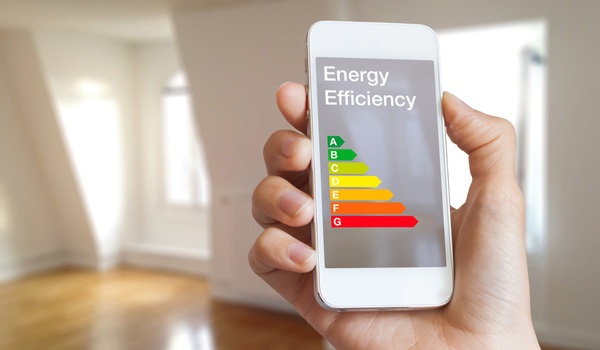 By reducing temperature fluctuations within the building, less energy and less cost is required for temperature regulation. 13. How does a green roof help in terms of sound insulation? It has been proven that green roofs can insulate up to 3 dB for internal sound insulation, and up to 8 dB for reflective sound. The layers of the green roof build-up, such as, substrate, plants, and trapped air, help to provide insulation of sound waves. Expressed in figures this might not be very impressive, but a noise reduction of 10 dB appears to the human ear as a noise reduction of 50 %. This can be especially advantageous for buildings near airports, or perennial machine activity as well as for noisy discotheques. In addition, high frequency electromagnetic radiation from mobile stations can also be effectively shielded. 14. How does a green roof help in terms of stormwater runoff? The natural cycles of the environment are interrupted when changes to the landscape are made. 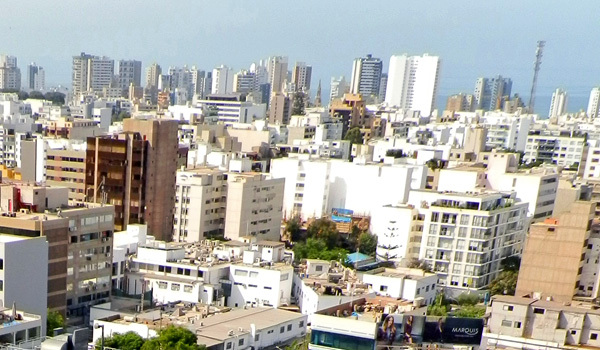 The development and expansion of cities significantly, if not completely, changes the natural environment. Constructions such as roadways and buildings create a seal over the ground and prevent rainwater from being absorbed. 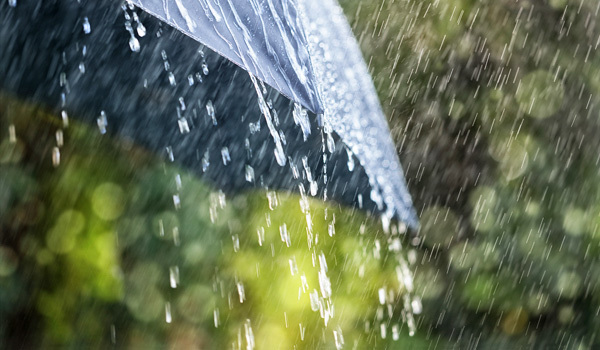 As a result, rainwater runs along the sealed surfaces picking up contamination in its path before reaching the sewer system and eventually being dumped directly into water bodies. Sewer systems are often stressed or flooded as a result of such large quantities of water arriving in a short period of time. Green roofs help restore aspects of the natural water cycle by absorbing and recycling rainwater. 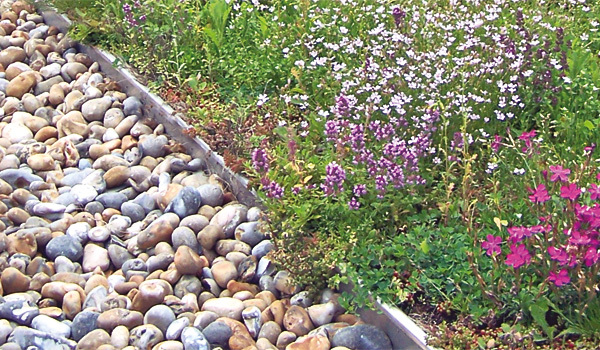 Runoff water can be reduced from 10–90 %, depending on the green roof build-up. Plants can then use the retained water for natural processes and consequently, acclimatize the surrounding environment. Excess water can be collected into cisterns or other collection devices. Even if it is not collected, runoff water is less of an issue for sewer systems because it is delayed by percolating through the green roof build-up. This means less water is reaching the sewer system at one time, and it is less likely for the systems to overflow. 15. What do green roofs offer regarding use of space? 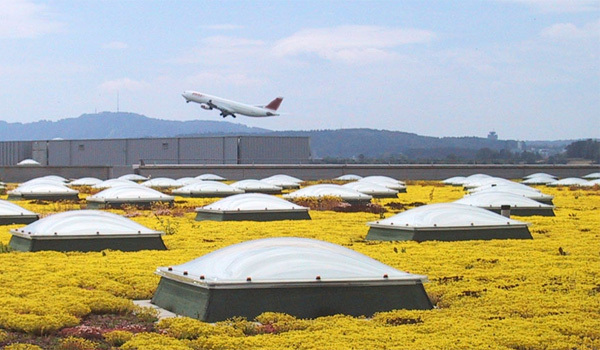 There are numerous applications which can be executed on green roofs. 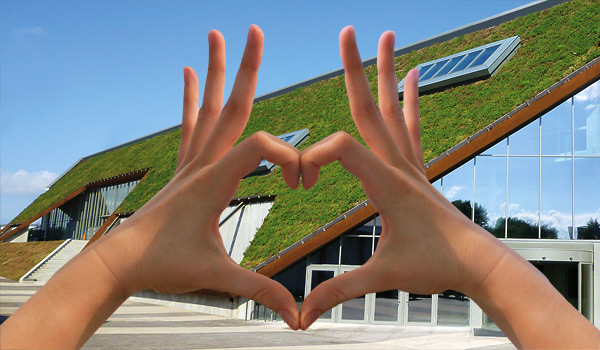 Low maintenance Green Roofs, recreational roof gardens, roof cafés, and sporting areas are all possible. Depending on the structural engineering, there are virtually no limits for architectural designs including perennials, small trees, terraces, or planters. At the same time the owner saves costs by not having to purchase additional land. A panoramic view, fresh air and privacy are also included into the price. Roof gardens not only markedly increase the quality of living and working environments, but also offer the possibility for natural and recreational areas to be enjoyed without additional travel. 16. How does a green roof work? Floradrain® collects the right amount of water and drains excess water. This is ideal in times of drought, as well as in the case of heavy rainfalls. Floradrain® is an underground channel system. It drains water and aerates the vegetation layer. This way, the substrate is prevented from getting too wet. In addition to the water retention, the air capacity in the substrate is very important. 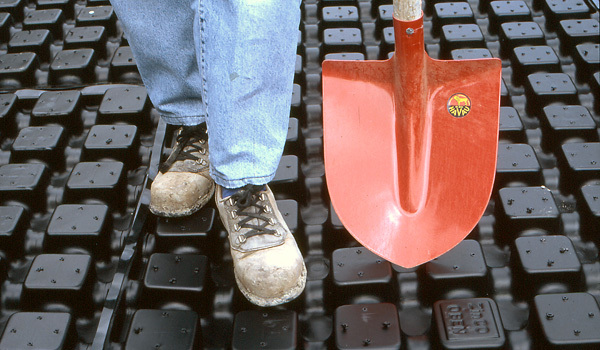 The Floradrain® provides a space for the ponding water in order to guarantee that the roots of the plants remain dry. 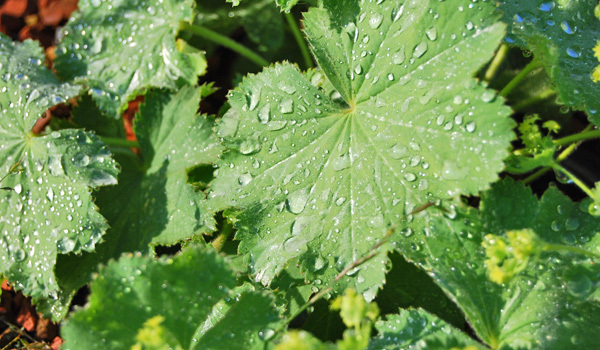 Floradrain® provides self-regulating irrigation by diffusion even in longer periods of drought. The diffusion starts when the substrate is dry, when the plants actually need water.